As batter flows, move funnel in a circle to form a spiral cake. * Fry about 2 minutes on each side, turning once until golden brown. Remove from oil and drain. Sprinkle with powdered sugar, glaze or nuts. Makes 6 cakes.... As batter flows, move funnel in a circle to form a spiral cake. * Fry about 2 minutes on each side, turning once until golden brown. Remove from oil and drain. Sprinkle with powdered sugar, glaze or nuts. Makes 6 cakes. 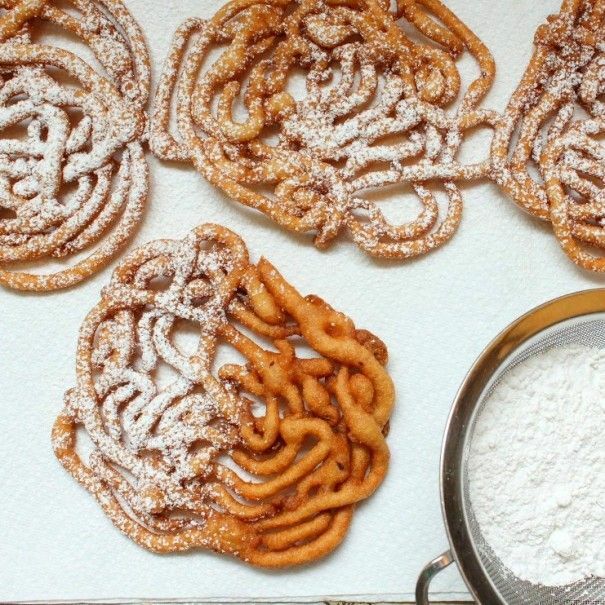 As batter flows, move funnel in a circle to form a spiral cake. * Fry about 2 minutes on each side, turning once until golden brown. Remove from oil and drain. Sprinkle with powdered sugar, glaze or nuts. Makes 6 cakes.